From a writer’s perspective, the saga of Post-Charismatic is something of a guided tour into the strange world of publishing, and the various and sundry ups and downs associated with it. In the early days of this blog, there was a lot of conversation back and forth about the growing number of disillusioned people from pentecostal/charismatic churches who were opting to leave the movement(s) they had once considered a source of spiritual vitality. I decided—at the encouragement of several blogging friends—to begin what I conceived of as “the mother of all research projects”: a series of blog posts to unpack the why’s behind the growing number of people who would self-identify as ‘post-charismatic’. It didn’t take long in my research to realize that a blog series wouldn’t do the topic justice. Instead, what was tentatively billed as “the Post-Charismatic Project” would be published as a subsection of my blog—an extremely large (and growing) subsection, as twenty months of research and writing took shape. Even before it’s release, several people suggested that I should look into getting the content published in book form. I did my best to “shop” the proposal around, but received zero response (note: possibly because my query letters sucked). So I went ahead with my initial plan and designed a website-within-a-blog for the content. In hindsight, I have no idea what inspired me to create this banner art. The website went public in early 2006, and word spread quickly around the digital world known as the ‘blogosphere’. A fellow blogger—Brother Maynard from Subversive Influence (who also provided invaluable critique/push-back of the early drafts)—created a forum for the website, where readers could interact on the various issues raised by the Project. To say the forum was inundated with lively debate would be a classic understatement. The publishing angle took an unexpected turn later that same year. An email arrived from jolly olde England, to inquire about publishing the Post-Charismatic Project. This was considered the ‘holy grail’ of blogging: an opportunity for a blogger to become a published author. At first, I thought the email was the digital equivalent of a prank phone call. Just in case, I decided to contact the company in question, and inquired whether or not a certain name was associated with them. And then it hit me: I had been ‘discovered’. I was going to be published. After a whirlwind of signing contracts and untangling governmental red tape surrounding a Canadian writer and a British publishing house, I was knee-deep in the process of having editors scour through my book, suggesting additions, deletions, areas where the material could be tightened up, and so on. It was a fun learning curve. I was even treated to that odd feeling that accompanies the first glimpse of the proposed cover art. Initially, I wasn’t a huge fan of either design, to be honest, but that’s part of the swirl of publication: you don’t have control over what the publisher decides (and they’re the experts, so you have to trust their instincts). In the end, they chose the second cover design, which was the better of the two in my limited opinion. And then another unexpected turn occurred. It took almost two years for Post-Charismatic? to be released in the UK, and over a year later before it finally became available on this side of the Atlantic. The book was being marketed in the UK, and I was already receiving emails and letters from readers, yet the North American release was indefinitely delayed with no explanation. As I later discovered, the British company had been bought out by an American publishing house, and their ‘rules’ for publication were quite different. In short, their sales department had determined I didn’t qualify to be published, but since legally-binding contracts had been signed, they were contractually obligated to the first print run. But that was as far as they would (grudgingly) go. For a writer, this was understandably frustrating and not a little deflating. The three-year print run came and went, and the muffled thud you may have heard was the (apparent) end of my shelf life as a published author. But in the months following the end of the print run, I continued to receive inquiries about the book’s availability, and also requests for a Kindle version. And I realized that there was another option available to me: self-publishing. It took almost half a year of wrangling with the American company, but I finally managed to obtain an official ‘authorial rights reversal’ (on company letterhead ’n’ everything), which means I was once more in legal control of what I did with my work. 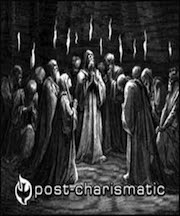 Post-Charismatic 2.0 was a proper second edition of the original manuscript—updated, edited (yet again, ruthlessly)—and with the new framing story of a fictional Charismatics Anonymous meeting to introduce and conclude the book. The learning curve to create both print and e-book formats was steep but rewarding, and having complete artistic control of my own work was well worth it. I could never have predicted how this publishing journey would unfold, back when I began researching for ‘a few blog posts’, but it’s been a challenging, satisfying, and ultimately empowering education.